The guided-missile destroyer conducted an emergency medical evacuation June 19 to assist a Sailor in need of medical attention aboard USS Shoup (DDG 86). Adm. Scott Swift visited South Korea June 15-18 to meet with senior leaders and express his support for Sailors and the U.S. Navy mission in Korea. The five-day symposium included discussions, workshops and a tabletop exercise built around civilian and military coordination to support a collaborative, rapid response to natural disasters in Timor-Leste. 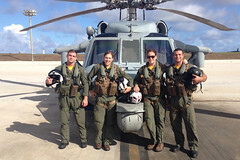 An MH-60S helicopter with Helicopter Sea Combat Squadron (HSC) 25 assisted in the recovery of two persons in distress 13 miles northwest of the Northern Mariana island of Tinian, June 18. 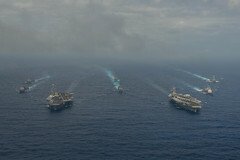 The USS John C. Stennis (CVN 74) and USS Ronald Reagan (CVN 76) strike groups commenced dual carrier flight operations in the Philippine Sea June 18. 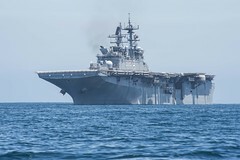 The three ships of the Makin Island Amphibious Ready Group completed a group sail off the coast of Southern California, June 17. 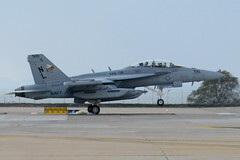 The first temporary detachment of U.S. Navy EA-18G Growler airborne electronic attack aircraft arrived at Clark Air Base, June 15, for training with Armed Forces of the Philippines FA-50 aircraft pilots. 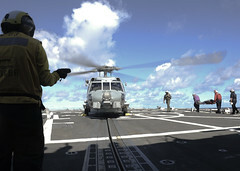 The 22nd annual Cooperation Afloat Readiness and Training (CARAT) exercise between the U.S. Navy, U.S. Marine Corps, and the Royal Thai Armed Forces will kick off June 16. 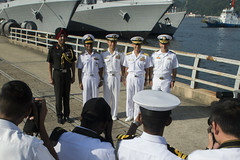 Ships from the Indian Navy, Japan Maritime Self-Defense Force and U.S. Navy departed U.S. Fleet Activities Sasebo, Japan, June 14 to conduct the at-sea phase of exercise Malabar 2016. 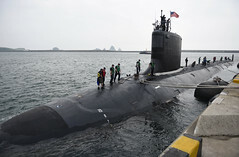 The Virginia-class attack submarine USS Mississippi (SSN 782) arrived in Busan, Republic of Korea, June 13 for a routine visit as part of its maiden deployment.